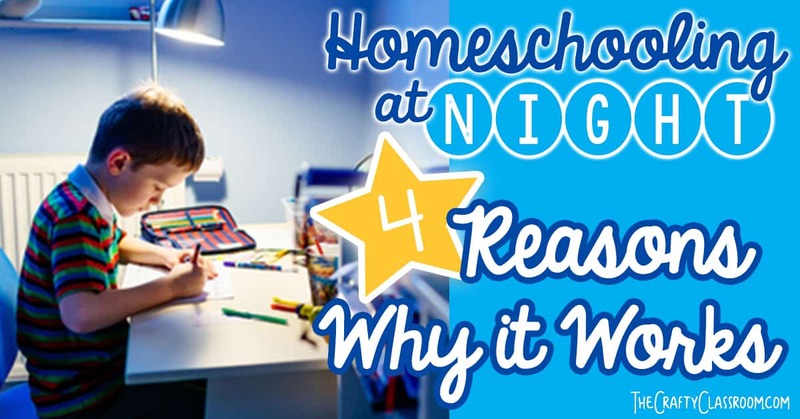 Does homeschooling at night really work? Many families say yes, it does! How do you homeschool at night, then, you ask? How do you know it is effective and doable? Here are four reasons people homeschool after the dinner plates have been put away, and why they say that it works! In speaking with friends and acquaintances who complete their homeschooling at night, we’ve found several reasons why it’s beneficial for them. Whether they are single homeschooling parents, balancing work and homeschooling, or just prefer to homeschool after dark, they usually have the following opinions. Families who homeschool later in the day love the flexibility that homeschooling provides. 1. Homeschooling at night works for busy schedules. Mornings and early afternoons are often filled with homeschool co-op activities, clubs, volunteer work, sports activities, and everyday tasks like grocery shopping or taking care of the home. Families who homeschool at night can do all these important activities first. They enjoy putting the actual book work on the shelf until afterward. These families find that these things are just as important as completing book work, and choose to put them first in the day. They can still complete the learning at night, learning new concepts and practicing skills by the light of the lamp. The evenings are usually quieter and have less distractions, which makes studying a little easier for many kids. 2. It’s better for night owls. The early bird gets the worm, but night owls can focus on their studies too – at night! In fact, night time is the ideal time for a night owl to work on homeschool work. They are often more focused and diligent later in the evenings rather than first thing in the morning. 3. It’s effective in families where the homeschooling parent works full time. Many homeschooling families are balancing their responsibilities as a homeschooling parent AND working full time outside the home. Families with teenagers commonly allow their teens to complete activities during the day while the parent is working. They attend group study opportunities such as a co-op, complete volunteer work or participate in clubs, sports, or extracurricular activities, or even hold their own part-time job. Then, they complete their homeschool assignments in the evenings with any needed oversight from mom or dad. 4. Homeschooling multiple children lends itself to homeschooling at least some of them at night. In large families, the homeschooling parent may find it hard to fit in everyone’s instruction time during the day. In the case of homeschooling multiple children of varying ages and grade levels, homeschooling them at different times throughout the day can help. Some parents find it more manageable to homeschool little ones in the evenings when their energy levels are lower and attention spans a little longer. In addition, homeschooling older children first can also free them to lend a helping hand with younger ones in the evenings while you work with the other children. Being a homeschooling family means that you have the flexibility in scheduling that most families don’t. If you are relaxed in your attitude about when studies can be completed during the day, then you just might find that homeschooling at night works!